Under fair lending, all decisions in any aspect of the lending process should be made without regard to any of the prohibited bases for discrimination contained in either the Equal Credit Opportunity Act or the Fair Housing Act. Fair lending begins with the notions that all applicants should have equal access to credit; that applications from similarly situated applicants should yield similar outcomes; and that applicants should only be treated differently if there is a documented legitimate business reason to do so. But the reach of fair lending goes far beyond applicants and applications. It affects how credit products are designed; how, where and to whom they are advertised; pricing; loan servicing; delinquency and loss mitigation management; and so much more. Fair lending is truly a "soup-to-nuts" concept affecting every form of credit offered. Intentional discrimination on a prohibited basis is exceedingly rare. But lending practices and policies that have a discriminatory impact can exist, despite a lack of discriminatory intent. Some types of lending criteria can appear facially neutral, but actually result in a disparate impact on a particular group. Requiring five years of employment history, for example, would have a disparate impact on young applicants because they wouldn't have a lengthy work history. Disparate impact can also result from an otherwise reasonable business decision, such as allowing loan officer or underwriting discretion in order to encourage lending responsiveness and creativity. The unintended result could be a disparate impact on a particular group if a statistically significant variance in rates or fees develops. The application of a disparate impact test to fair lending has been controversial, but it isn't going away any time soon. HUD promulgated a new rule on the subject in February, 2013. Recent enforcement actions demonstrate the doctrine's use by financial institution regulators. And the Magner and Mt. Holly cases, which were to focus the Supreme Court's attention on the issue, were both settled at the 11th hour, taking the issue off of the high court's table. About the Speakers: Mary Beth Guard currently serves as Executive Editor of BankersOnline.com and CEO of Glia Group, Inc., Mary Beth has had a long and distinguished career, graduating from law school in 1980, then going on to serve as general counsel for the Oklahoma State Banking Department, general counsel for the Oklahoma Bankers Association, and EVP of Specialized services for Thomson Financial Publishing prior to co-founding Glia Group, Inc. and BankersOnline.com. Mary Beth also serves as Executive Editor for BankingQuestions.com and as a partner in BankGuard Resources. Mary Beth is on the advisory board for Bankers' Hotline. She has presented training programs for virtually every major national financial industry association, as well as more than a dozen state bankers associations and a host of other organizations. In addition, Mary Beth has written more than a thousand banking-related articles and is a BOL Guru. Sonja Kriegsmann is new to the BankersOnline staff. She serves as the Executive Manager of BOL Insiders, LLC. She joined the BankersOnline team in early 2013 to develop and manage this members-only product offering. Her more than 32 years of banking experience, with over 27 years as an attorney, includes both deposits and lending on the retail side of the bank and in administration developing policies and procedures, as compliance officer, and as in-house counsel. She has also worked as outside counsel to banks of a variety of sizes as well as other entities in the financial industry. She has worked for and with community, regional, and national banks. While in private practice, Sonja worked extensively with the Indiana Bankers Association assisting banks of all sizes with compliance and operational issues. She has taught a variety of seminars and published a monthly compliance column in the Hoosier Banker magazine. Sonja has also been published in the ABA Bank Compliance magazine. 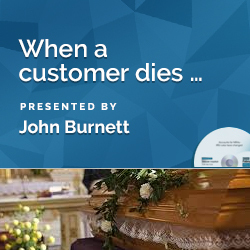 This program was recorded in its entirety in March 2014. The CD-ROM includes program slides, materials (if available) and follow-up Q & A document. 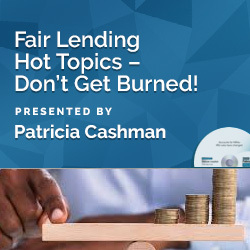 Fair Lending Hot Topics – Don’t Get Burned!